Everyone loves a meal where you can get messy. 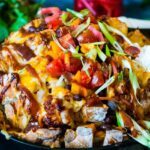 This Tailgating Pull Apart BBQ Chicken Bread is crazy fun! Place the chicken in the slow cooker with ½ cup Head Country Chipotle Bar-B-Que Sauce, Head Country Original Championship Seasoning. Add the onion and season with salt and pepper. Cook on low for 5 to 6 hours, until the chicken shreds easily with 2 forks. Slice the bread almost through to the bottom from one side to the other being careful to not cut through. Rotate the bread and slice, making a crosshatch, carefully not slicing all the way through again. Pull the bread apart gently. And place into a large cast iron skillet. Slide the bread in the oven and toast 5 to 7 minutes. Sprinkle a thin layer of cheese of the bread, making sure the cheese falls into the slices. Place back in the oven to melt the cheese another 5 minutes. Remove from oven and spoon the shredded chicken over top and cover with cheese. Place back into the oven and toast the cheese again for another 5 minutes. Drizzle with the remaining barbecue sauce. Top with the scallions, black beans, cherry tomatoes, a dollop of sour cream and pickled red onions. All the oven instructions can be replaced with a grill.